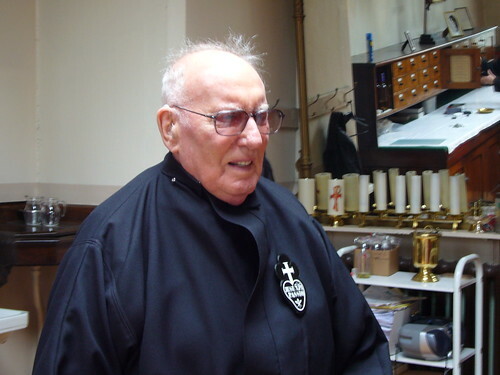 Father Hubert before his Diamond Jubilee Mass in 2007. At six o’clock this morning, Father Hubert (Hurley) C.P. died in Glasgow Royal Infirmary, where he had been a patient since 6 December, when he had fallen and fractured his femur. He was eighty-eight years old. Charlie Hurley was born in Drogheda but grew up in Dublin, attending the Irish Christian Brothers School in Synge Street, where he was a classmate of former Taoiseach (Prime Minister) Liam Cosgrave. Having been an altar boy in Mount Argus, he entered the Passionist novitiate at the Graan, Enniskillen, taking the religious name Hubert. After his ordination, he gave some missions and also served three times as chaplain to the Glasgow Royal Infirmary. However, most of his life was spent in administration or in parish work. He was vicar in several houses (the Graan, Ardoyne, Drum-Mohr, Coodham, Mount Argus) and was superior and parish priest at Prestonpans from 1974 to 1980. He was also Provincial Consultor for a short time in the 1960s. In 1981, failing eyesight caused him to resign as rector of Cloonamahon only one year after taking up the appointment. After a short stay at Crossgar, he moved to Scotland where he remained until his death. I lived in community with Father Hubert in the 1980s and again in the last twelve years of his life; he went into hospital just nine days before I moved to Prestonpans. What was he like? He loved learning about the bible and he loved to pray. He spent hours each day in prayer and would be at Mass as many times in the day as possible. He was very dedicated to the confessional and was always patient with people. He would go to extraordinary lengths to help someone in need. At the same time, he loved causing turmoil in the community, saying outrageous things at mealtimes, such as “In the early church, they were forbidden to use an altar” or “Confession is against human rights”; then, having got everyone’s blood pressure up, he would wander off to say another rosary for peace. When I met him on the staircase one day, he said to me: “I pray for you every time I walk up these stairs”; then his blind eyes twinkled and he added: “I don’t know why I bother.” In the same vein, he could propose the abolition of priestly celibacy and the ordination of women in one breath, while upholding the value of Padre Pio’s mitten in the next. He loved being controversial; I suspect that the content was less important than the fun. May the Lord welcome him with a forgiving smile, as he himself welcomed so many others during his long life.